The Bioscope returns from its travels in Ireland and Wales (about which you will learn something in due course) to report once more on what’s been happening in the world of early and silent cinema. Kicking things off, the Sulphur Springs Collection of Pre-Nickelodeon Films is a collection of early American films recently published online. The collection is part of the G. William Jones Film and Video Collection (formerly the Southwest Film/Video Archive) held by Southern Methodist University (SMU), Dallas, Texas. 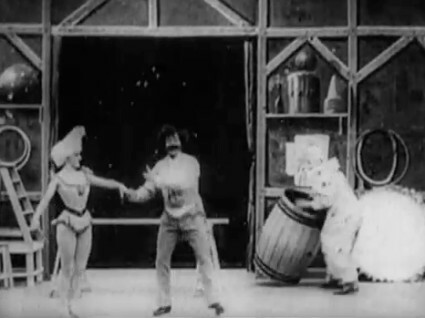 Twenty-nine of the thirty-three films, dating 1898-1906, have been published as part of SMU’s Central University Libraries (CUL) Digital Collections. Below is a list the films being made available. Highlights include a Lubin imitation of Edison’s Life of an American Fireman (Lubin was notorious for borrowing other companies’ good ideas), several Edison panoramic films of the San Francisco earthquake of 1906, an atavistic chase film Tracked By Bloodhounds, or A Lynching in Cripple Creek (the victim is not black), and the otherwise lost Georges Méliès film, La Clownesse fantôme. The files in this collection are protected by copyright law. No commercial reproduction or distribution of these files is permitted without the written permission of Southern Methodist University, Central University Libraries. These files may be freely used for educational purposes, provided they are not altered in any way, and Southern Methodist University is cited. So now you know. It’s an excellent collection, ranging from single-shot actualities to multi-shot narratives, informative, coherent and illuminating. You can find out more about the collection, with background on all of the films, including the four not included online)) in Rick Worland, ‘The Sulphur Springs, Texas early films discovery‘, Journal of Film Preservation 51 (1995), pp. 56-64, available in PDF format from the FIAF site. It will get added to the Bioscope’s list of video sources. Go explore.